The "Beach Cottage” is located just 2 blocks from the Morro Strand State Beach, a five mile uninterrupted expanse of sand and waves. As you drink coffee in the morning, you can sit at the breakfast nook or on the glass enclosed front deck and watch the waves break with Morro Rock to the South and all of Estero Bay to the western horizon. One can actually see 50 miles of coast; south of Montana De Oro (Point Bishon) and north to Estero Point (north of the abalone farm). 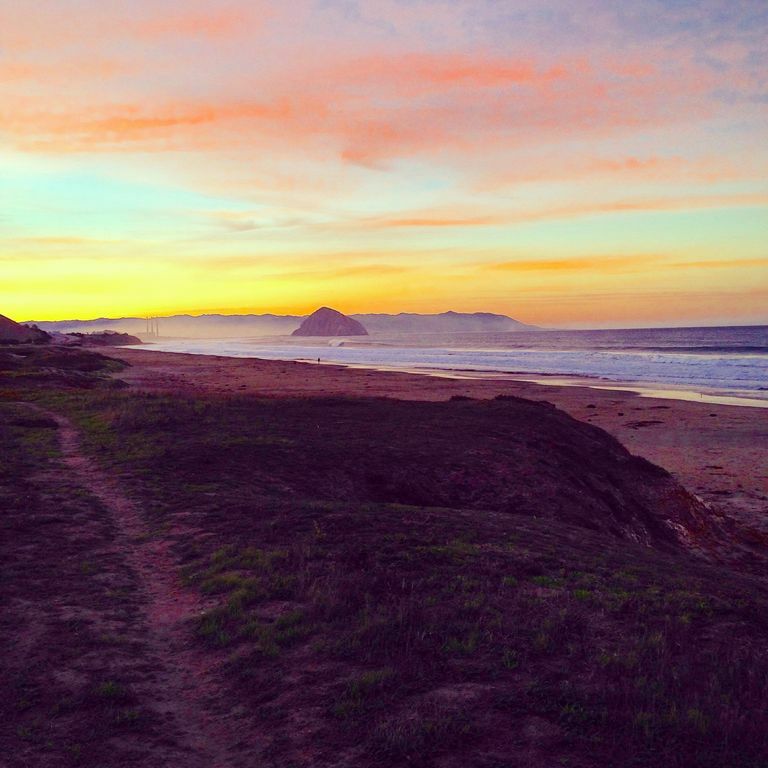 At the south end of Cayucos on Ocean Blvd, you are surrounded by headland hills and blue water. Most days you will see local professionals soaring off the tops in their para-gliders, right behind the house, landing on the flat in front of the beach…cool! The house has been totally remodeled. Walls have been removed and sight lines were considered so that you have views from everywhere in the great room. The deck has comfortable chairs, a table for dining, gas grill and a 10’ umbrella for sun protection. The kitchen has a suite of Samsung stainless appliances, quartz countertops throughout, and instant hot water for tea or hot chocolate for those cool, windy afternoons and filtered cold water. The great room offers comfortable seating for conversation or making use of the 50” flat screen Smart TV; Premium Channels package, and sound system. The full bath has top of the line hardware, tub/shower option, water saver loo, and double sinks; storage for your personal beach towels, can be stacked in the ample storage closet. The 3/4 bath also has water saver loo, walk in shower, and sink with storage beneath. The Guest bedroom has a queen bed and is tastefully decorated with a 47" flat screen Smart TV. The Master bedroom has a Cal-King, high boy dresser, and also a 47” flat screen Smart TV. The back yard has a quiet setting with a water fountain, succulent garden, and a fire pit for those roasted marshmallows and Smores. A storage shed is available for larger toys like surfboards, bikes, or things that DO NOT GO IN THE HOUSE! The backyard is enclosed and lockable. There is no garage privilege. Owners store rental paraphernalia there. NOTE...We added a space over the garage and carport in 2018 that the owners use occasionally. It was designed by our architect to elimate any sound transference between floors. Cindy and I grew up in the Central Valley of California and always loved the surf, boarding and fishing. After owning rental homes in Fresno, our home town, we decided to get into the Central Coast housing market with a full time rental in Los Osos in 2000, thinking that it was where we would like to retire, eventually. Fourteen years later, as we closed in on retirement, we were able to trade rentals when we found the Cayucos house. With a vision in our minds and countless hours of watching DIY shows, we hired an architect and a contractor to make our dream reality. In the last month, as we finished our work, we’ve had 4 generations of family spend time with us and, as you can imagine, loved the experience. Alas, we must rent the property to complete the 1031 Tax Exchange rules, followed by a full time residence. We can hardly wait. Without doubt, the view, the closeness to the ocean, and the comfort of the home are its unique qualities. The family throws their toys and towels into the wagon and we walk to the beach. Within 3 minutes, we are in sand, shoes off, wind in our face, waves crashing at our feet. Kids are digging in the sand, surfers are working the waves and couples are walking their dogs for miles. Nice place to be! Aside from beach life, there are a multitude of other activities. World renown wine country with more than 70 wineries to visit and taste. Gather friends and let someone else do the driving. Sightseeing up and down the coast: Hearst Castle, sea lion rookery, Montana De Oro, Big Sur, Artist Colony at Harmony, fine dining in towns up and down the coast, and last but not least, you could simply put your feet up, read a book and relax... the Pacific Ocean stretching for as far as you can see. toilet, shower, New enlarged tiled shower with glass door in 2018! There are 2 bathrooms. One full bathroom has tub/shower combo, 2 sinks, storage cabinets, eco friendly toilet & heater. One 3/4 bathroom with large tiled walk-in shower and eco friendly toilet & heater. This charming beach cottage has beach views from Morro Rock to the south end of Cayucos. Watch surfers riding the waves, watch the Para-sailors take off from the hills to the East and ride the wind. The Cottage's deck has a 180 degree ocean view of Estero Bay from Buchon Point to Estero Point (50 miles totally unobstructed). The sunsets are spectacular. A glass of wine enhances the experience. Coffee, tea, spices, oil, paper towels, toilet paper, etc. We provide cable television and wifi access. Board games & cards games for several ages. The gated front deck provides a panorama view of Estero Bay with comfortable seating with gas grill. Back patio is enclosed with pavers, fire pit, water feature, storage shed with beach chairs & toys. A cleaning fee is additional and if you would like housekeeping during your stay, it is available upon your request. This home is wonderful! It is fully updated with many little details that make it a comfortable place to stay. When we arrived there was a nice note from Greg and Cindy saying enjoy a bottle of wine on us. It was such a welcoming gesture and much appreciated. The view from the front porch is stunning. We enjoyed the sunsets every night. There is also a great view of Morrow rock. It was a great location to visit Morrow Bay and Cambria. It also has a nice private backyard with a fire pit and beautiful plants. The two bedrooms were spacious and each had their own flat screen tv’s. It is perfectly suited for four people, although I know it can accommodate up to 6. We were also allowed to bring our dog for an extra fee which made the experience that much better. Thank you Greg and Cindy for your hospitality. We will be back. We had a wonderful, relaxing visit in this wonderful home. Greg and Cindy were just a text away with any questions. The home has a great layout that invites conversation and relaxation and we never felt crowded with all 4 of us coming and going. Comfortable beds, great TV, working, modern kitchen....we could not have asked for a better holiday! My family of 5 with 2 kids and our dog Rosie loved our stay in Cayucas. The place was so clean, newly renovated and perfectly laid out with 2 bedrooms and 2 full bath. We loved the deck and enjoyed BBQ'ing on it. Our daughters loved that there were wet suits, boogie boards and airwalk board - They spent 2 days in the ocean! Cindy and Greg couldn't be any nicer and gave us recommendations on restaurants. We didn't know the area so we liked that we were close a drive to Cayucas downtown, Morro Bay, San Luis Obisbo, Hearst Castle and Elephant Seals. While the beach is close by, we decided to drive since Hwy 1 is 4 lanes and there's no light, but since we had so much stuff between beach chairs, boogie boards etc we needed the car. Thanks for hosting us! We enjoyed our family spring break in your beach cottage. Spotless and filled with nice touches to make your stay super comfortable and relaxing. The beds are great and the kitchen is fully stocked with everything you could possibly want...except a ladle. Oh well, nothing is perfect. Seriously...there is no downside to this rental. The beach is close and the town is cute and quirky as a beach town should be. And Morro Bay is close by if you want some of the kayaking and shopping and excursions that can be so fun there. Excellent home! Beautiful, clean, and comfortable, and close to the Beach! Excellent house with everything you’d hope for in a rental. Lovely living room area with lots of seating. Nice kitchen with plenty of dishes, pots and pans, utensils, and spices. Comfortable beds. Beautiful, spacious bathrooms. Great outdoor areas. We would definitely rent this place again! The only negative aspect of the house is it’s proximity to the highway... but, inside the house, and in the backyard, it’s quite quiet. At night, it’s also peaceful, so it’s not all that negative of a point really. Like I said, we’d stay here again! We had a very fun and pleasant weekend. Thank you, Greg and Cindy! If you are lucky enough to stay here, you're lucky enough! This was our second sojourn at this lovely beach bungalow, and it didn't disappoint. Cindy and Greg have thought of everything to make this little home a true home away from home. Not only is it beautifully decorated in a calming and very tasteful beachy theme, but the home itself is so well planned that one never feels crowded. The kitchen is very well stocked, and beautifully designed for efficiency and ease of use. It was pure pleasure to cook there. The bathrooms are equally well designed, with ample storage for toiletries. The "new" second bath with walk in shower is gorgeous--perfect if a guest has difficulty with tubs. There's even an outdoor shower to wash off sand from the beach, which is a short walk away and one of our favorite places to spend time--get the Tide Book and plan your days around the ocean. You won't be disappointed. Indeed, this property is so conveniently located that we were able to travel to favorite sites with absolutely no hassle. Rainy days? No problem! We were so comfortable inside, that we never felt "trapped" by the weather, and if we wanted to go out, Cayucos and Morro Bay, Cambria and San Luis Obispo were all short drives away. And it was a true pleasure to meet Cindy and Greg, the owners, when they were in residence. They were so thoughtful and quick to respond, and made us feel right at home. It truly was a FIVE star experience! Thank you for your kind words! We are so glad that you enjoyed the new second walk in shower. It was specifically designed for ease of use and mobility concerns. As you pointed out, Cayucos is a perfect location to access to multiple destinations of interest. Cayucos is truly a hidden gem on the Central Coast and we are so happy that we are able to share “A Shore Thing” with people like you! It was a pleasure meeting you, your second stay with us, and we look forward to having you back again next year! Aside from the easy beach access and its related activities, sight seeing is a favorite of ours. The Central Coast provides a jumping off place for the hidden wonders of Highway One. Driving north, you have mostly ocean views from Cayucos to Hearst Castle to Big Sur to Carmel and return on HWY 101. Described by Sunset Magazine as one of the most beautiful roads in the world. A long day trip, for sure, but something you'll never forget. Secondly, the Wine Scene in the Central Coast Region is building a reputation for world class libation. Just wandering around the green hills off of HYW 46, near the artistic colony of Harmony, population 23, to Paso Robles gives you more than 70 wineries that have been reviewed with high praise the world over. Gather friends and let someone else do the driving; music and food is available at many of the venues. PET FEES ARE $25.00 PER DAY, TWO DOG MAXIMUM...IF ALL PETS ARE NOT INCLUDED ON CONTRACT, YOU FORFEIT YOUR FULL DAMAGE DEPOSIT! DURING PEAK SEASON less than a week would be under consideration. TRAVEL INSURANCE can be provided through CSA Travel Protection @ 800-349-8670, a HomeAway affiliate. UNTIL RESERVATION CONFIRMED, DATES AND RATES ARE SUBJECT TO CHANGE WITHOUT NOTICE.